A deeper look at the grooves pressed into the Karma For Cheap LP by Aaron Lee Tasjan. The single greatest problem from which Karma For Cheap (and it’s auteur, Aaron Lee Tasjan, by extension) suffers is that it’s just too polished and the the seams on it are too air-tight. For that reason, it’s difficult for listeners to not meet the music with more than a little bit of suspicion. This is precisely the same problem from which artists like Marc Bolan and Chris Isaak has suffered, over the years; out of the box, they’re just too focused, too polished and too damned good at what they do. Such quality creates a kind of stalemate the artist and their music – it’s impossible to know where they’ll go next because there are no loose threads which could extend outward from the album and into new ideas. …And in having let all of the above blurt out first, I’ve committed the same creative error as those aforementioned artists: I’ve begun at a conclusion, so I have to try and work backwards in order to explain both myself and my opinion. That said, here we go…. 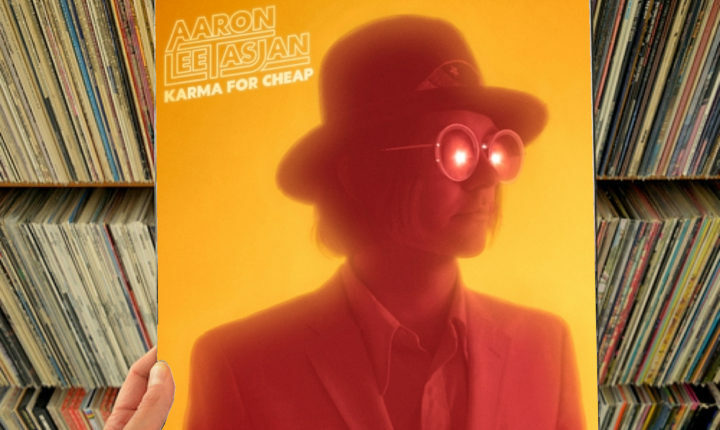 As soon as “If Not Now, When?” opens the A-side of Karma For Cheap, listeners are presented with the thoroughly unusual aural world of Aaron Lee Tasjan. There, wobbly and tremolo infused tones characterize Tasjan’s guitar performance (which is where you’ll also find the Marc Bolan/T. Rex angle) and decidedly old school country croon (which is where the comparisons to Chris Isaak manifest) dominate the song, and the combination (after listeners have accepted it) ends up being a little bit lovable – even if it never stops feeling more than a little weird after the song exhausts its three-and-a-half-minute running. That isn’t to say listeners will be instantly turned off of the whole endeavor, just that they may be left with a weird taste in their mouths. The thread first unwound by “If Not Now, When?” (that sort of crooning, Space Cowboy vibe) endures with “The Truth Is So Hard To Believe,” but gets exponentially better with the addition of a delightfully crunchy, distorted guitar part before getting a little more post-modern and vocally coy/cutesy with “The Rest Is Yet To Come” (which I think should have ended the side, but that’s just this critic) and then finally winding down with “The End Of The Day,” which closes the side. Throughout these five cuts, listeners will find it impossible to turn away from or deny any of what Tasjan spins; while no track is perfectly flawless (there’s a bum tone here, a bad beat there and an unwise choice somewhere else), there is invariably a unique choice (be it vocal, lyrical or instrumental) on each one which will keep listeners glued to the album and, because the interesting aspects of each always change from cut-to-cut, the A-side ends up coming off as feeling well-rounded too. While the B-side of the album doesn’t begin the same way the A- did (“Dream Dreamer” is a sleepy, acoustic number in much the same vein Ricky Nelson’s “Lonesome Town” was), there’s no arguing that the song presents a different side of Aaron Tasjan. Far more “country” than “rock,” “Dream Dreamer” sees the singer try to worm his way into the hearts and minds of listeners slowly – methodically – and with more than a little bit of style. It can work too – the warmth of Tasjan’s voice is hypnotic – but listeners will find themselves happy to discover that “Set You Free” moves in a poppier direction and almost brushes on Beatles-level brilliance on its way through. There, the guitars get leaner and jangly in a Rickenbacher kind of way, and the singer’s spell over listeners is successfully renewed; they’ll hang on Tasjan’s every word through “Set You Free” (thanks to couplets like, “Your mind is a pool that I want to dive into/ And this world is so full of these nothin’ kind of fools”) and then breeze easily into the smooth country-rock of “Crawling At Your Feet” (where the devil has the singer’s number and his phone won’t stop) and finally collapsing into “Songbird” to close out the side. Now, regarding “Songbird,” it is worth noting how impressive it is that Tasjan is able to sew the whole album together and arrive in about the same place he was at when the album began. Here, Tasjan returns to the tremolo-effected guitar tone which powered “If Not Now, When?,” however with the added benefit of a poppier and more confident vocal melody and a more stomping and propulsive drum part. In that way, “Songbird” feels like growth made – even from the beginning of the record’s play and leaves listeners wondering about where Tasjan may be headed on his next release. Karma For Cheap is out now on vinyl, CD and digital formats. Buy it here on Amazon.